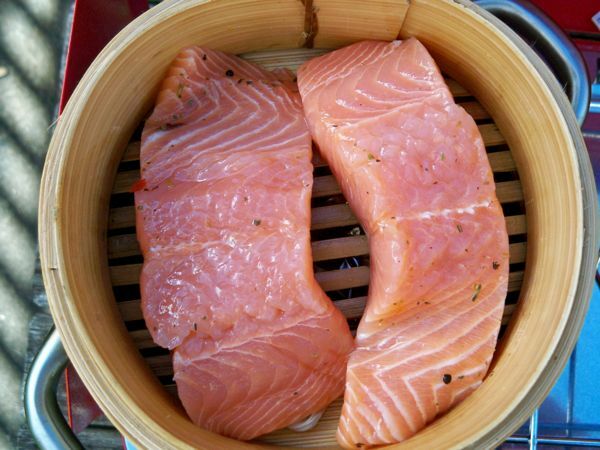 Kris : Smoking fish is a little time consuming, but not hard and worth the effort when you finally get to eat it! The first step is to brine the salmon for 8-10 hours. Combine all the ingredients in a bowl. Once it has cooled, place the salmon in the brine solution. Place it in a snap lock bag and leave in the fridge for 8 hours. I used a combination of wood chips and really dry hop flowers. You can purchase wood chips for smoking at hardware stores. I picked these hops earlier this year and stored them in a calico bag. You can also buy hop flowers from home brew stores, but don’t use hop pellets, they would be way too strong. You can buy an expensive smoke box, but you don’t need to. Caroline: We don’t have a smoker so we had to improvise (just how we like it). 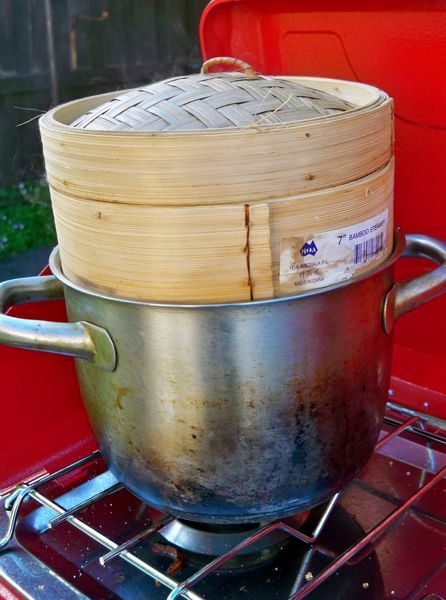 We used an old pot (the wood chips and pellets will probably stain and stink it, so use one you feel ok chucking or keeping only for smoking in the future) and a bamboo steamer (only a couple bucks at asian grocery). this is a project that I highly recommend executing OUTSIDE. It will stink up your house like fish and bonfire for a long time otherwise…. Kris: I smoked the salmon for 20-25minutes on the lowest heat possible. It is ready when the salmon falls apart when pressed with a fork. 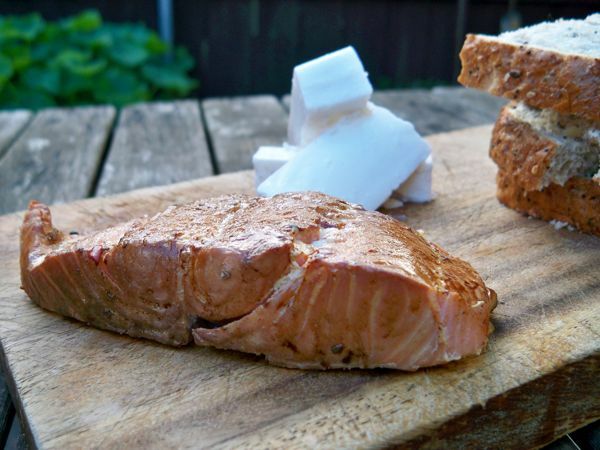 Kris: We ate the salmon with some really creamy goat’s fetta and fresh sourdough. You could use goat’s chevre also. Little Creatures Pale Ale was a great match for this dish. The citrus/grapefruit hop character and carbonation cut through the richness of the salmon and the goat’s cheese. Definitely worth the wait. Caroline : The salmon was so smoky and delicious! Felt like I was eating fish over a bonfire on the beach…I can dream can’t i? This entry was posted in Beer, Recipes, Snacks and tagged hops, pale ale, salmon, seafood.